Carter Ratcliff | Poetry, art, and what not? Poetry, art, and what not? This is my contribution to Message Ahead: Poets Respond to the Poems of Jonas Mekas, published last year by Rail Editions. Jonas Mekas published Words Apart, a book of poems, in 1967. Reappearing this year in a new translation by the poet Vyt Bakaitis, the collection feels timely—and that is strange. Words Apart is more than four decades old; moreover, it testifies to Mekas’s thoughts and feelings, his state of being, at an even earlier period: the years just after the Second World War. Released from a Nazi labor camp as the war ended, he settled into the role of philosophy student at the University of Mainz, in southwestern Germany. Nonetheless, he felt adrift—psychically, if not literally—until 1949, when he and his brother Adolfus were resettled in Brooklyn by the Refugee Organization of the United Nations. The poet’s sharp focus on fugitive sensations illuminates his isolation in self-awareness. His perceptions are all he has, and sometimes these diminish to nearly nothing. Forsaken by the past, marooned in a present disconnected from any future, the poet has inoculated himself against nostalgia. There is only the moment, inflected by feelings of loneliness, physical sensations, and the visible things—other human beings among them—that give the poems of Words Apart their subject matter. These drifting, sometimes flickering phenomena have no backdrop, social, cultural, or historical. Slowly, one realizes how strange this is. Most poems emerge, however circuitously, from a coherent world. Mekas’s do not, as the poet is acutely but never bitterly aware. more signs . . . In this darkness, we see clearly the precision with which Mekas reprises the opening of Dante’s Inferno. For the earlier poet also speaks of having reached the mid-point of his life and finding himself in a dark wood (selva oscura), unable to find a clear path (diritta via). Soon Dante encounters three beasts—a leopard, a lion, and a she-wolf—each laden with symbolic meanings as sinister as they are obscure. As he continues his journey, symbols proliferate, meanings intertwine, and soon we are enmeshed in a pattern of historical allusion and theological speculation so vast and complex that it takes on the scale and speculative richness of a cosmology. it may seem that he softens his rejection of European tradition by acknowledging Homer, who so often describes the sea as “wine-dark.” But he is doing the opposite, echoing Homer only to extend to ancient times the range of the cultural inheritance he rejects. From 1949 to the present, Mekas has understood himself as the sort of American who inhabits a fluid, improvised present devoted to the future and its precedent-free possibilities. Mekas realizes these possibilities chiefly in film. He is a major figure in the history of avant-garde cinema in the United States. Yet he has always written—the list of his publications includes autobiographies, diaries, memoirs, and poetry—and his style in both of his mediums has always tended toward unadorned clarity. Hence his filmic and poetic imagery join to make it plausible to see him as a late recruit to Imagism, a movement launched in the 1910s by a small band of American and English poets determined to rescue poetry from the extravagant metaphor and decorative surplus cultivated by late Victorian poets. The idea of Mekas as an Imagist gains strength from a choice Bakaitis, his translator, made at the outset of Words Apart. The Lithuanian title of the book’s first section is “Vaizdai,” a word that could be rendered in English as “views,” “vistas,” “appearances,” “spectacles,” or “images.” By choosing the last of these, Bakaitis brings the Imagists to mind and prompts us to ask if Mekas belongs in the company of Ezra Pound, Hilda Doolittle (HD), William Carlos Williams, and other members of the group. He does not and, in seeing why not, we see Mekas a bit more clearly. Pound means neither the truth established by scientific experiment nor that of the ordinary observations that guide us through the world. He appeals to an idea of timelessly transcendent truth—Truth with a capital “T”—that is rooted in Platonism. The Neoplatonist Plotinus, Renaissance and Baroque theorists, and Romantics of the late eighteenth and early nineteenth centuries all argued that art and literature can be vehicles of—or windows onto—Truth of this exalted kind. And their arguments persist, much revised, in certain strands of modernism. Pound and the other Imagists were, if not strict Neoplatonists, then heirs to this ancient faith. Like Plotinus, they believed that a poem or painting succeeds by revealing an essence: the ultimate, absolute, and immutable Truth of its subject. Mekas signals his awareness of this tradition in “Remnants of a Journey,” the third section of Words Apart. With this passage, Mekas renounces the quest for essences. Or, as he says elsewhere, he rejects Europe’s “logic and reason” (II, 7)—his metonym for the Platonism that infuses the art of Michelangelo, the poetry of Percy Bysshe Shelley, and the theories of racial essence that provided European fascism with its metaphysical underpinnings. In the aftermath of his and Lithuania’s encounters with Nazi Germany, Mekas extricated himself from two and a half millennia of European metaphysics. Thus he joined the company of such American non-metaphysicians as the pragmatist John Dewey, the ironist Andy Warhol, and Merce Cunningham, choreographer of ordinary movement. Separating himself from such New-World seekers of Old-World essences as Ezra Pound and the other Imagists, he became, in a way, more American than they were. As a bio-pic, the Amy documentary is so-so, providing just enough evidence to let us see that her family was the real thing when it came to dysfunctionality. We want more detail more coherently laid out. On the other hand, all the fine-grained detail in the world might not have explained why the singer was so vulnerable to everything that undermined and eventually destroyed her. No matter how thoroughly we riffle their pages, some psyches remain closed books. Which doesn’t mean that Amy is a bad movie. The main point of it is to show images from every stage of in the rise and fall of a stunningly powerful performer, and here it succeeds. In one clip after another we are confronted by a presence difficult to describe without falling back on the ready-to-hand notion of expressiveness. Amy Winehouse was, no question, among the most expressive singers ever. Yet the notion of expression has to be nuanced a bit before it applies to her in any adequate way. A mouse runs up the leg of someone’s pants. The person screams in surprise and fear. That’s expressive. A driver, cut off in traffic, bellows in mindless outrage. That too is expressive. Amy Winehouse’s expressiveness is more—what? Subtle? Modulated? Sophisticated? We could add to this list of adjectives but that wouldn’t help because her singing is not merely expressive. It is detached, as strange as that may sound, and if it were not for her detachment she couldn’t have come anywhere near the power she wielded at her amazing best. Written during the 1770s, Denis Diderot’s “The Paradox of the Actor ” takes on the commonsense idea that the best actors become the characters they play—that a performance is convincing to the degree that the emotions the actor expresses simply are those of Hamlet or Willy Loman or whichever character is being portrayed. Wrong, said Diderot, who saw that sort of identification as undisciplined and prone to bombastic excess. Good actors, he argued, detach themselves from the characters they play, the better to understand and accurately represent the emotions of these fictional personages. I don’t say that Diderot is entirely right. I do say that he is on to something—namely, the self-awareness that guides, inflects, and deepens the expression of emotion onstage. This is a kind of detachment. And it requires a kind of intelligence, more intuitive than analytical, that all great performers have. This intelligence is what draws us to memorable acting or singing. We respond not simply to displays of feeling but to signs that the emotions on display are in some way understood by the performer and thus consciously meant. For audience and performer are not joined by floods of emotion. 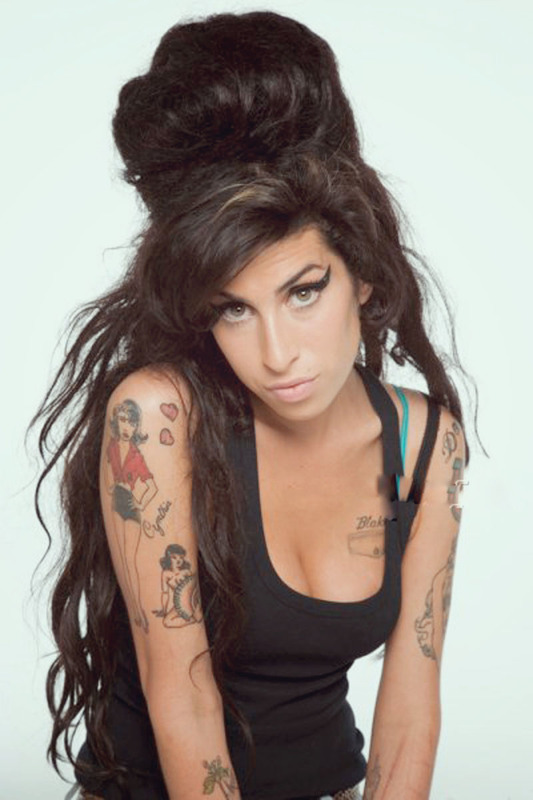 They are joined by shared meanings, and Amy Winehouse had the power to convey meaning of white-hot intensity. A clip in Amy shows her talking with Tony Bennett about singing a song differently every time. This is what jazz singers do and what she did in the early stages of her career. Then she had mega pop hits and acquired a mega audience of fans who wanted not her subtleties but the product they bought into—and of course they wanted it the same every time. This could only have been devastating to the signer, a denial of all that meant anything to her—of everything worth living for. As this year’s Whitney Biennial folds its tent and drifts away let us remember that, if it did nothing else, it gave people an opportunity to say something that they’ve been saying for years: curators are now artists. Or they are acting like artists, treating works of art as readymade bits and pieces to be arranged in mega- (or meta-) works at the scale of the museum. I suppose the medium is assemblage and I suppose the rationale is that, these days, a work of art often looks like a curated conglomeration of objects, styles, and themes, so why not scale it up? Why not give an entire exhibit the neither-here-nor-there look of a single, super-hip artwork’s survey of currently viable options? And if “currently viable options” sounds bureaucratic, well . . . how else should it sound? I’m sure I have more to say about the Biennial but I’m not sure, at this point, what that might be. 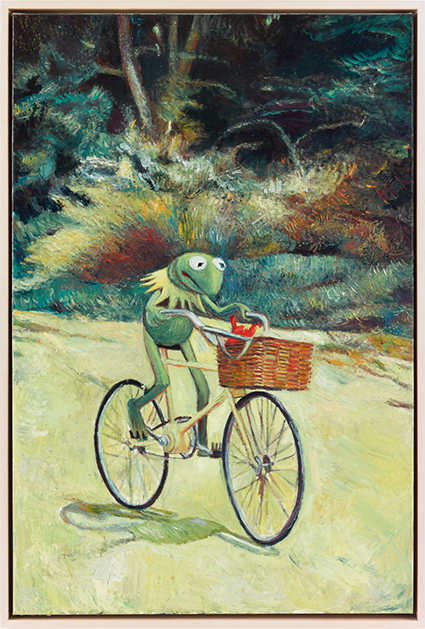 For now I’ll just note that I like this image of Kermit the Frog from Keith Mayerson’s only vaguely curated salon-style conglomeration of all sorts of images gathered from various points on the cultural map. 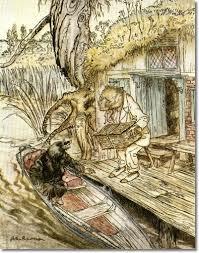 This picture now has a secure place beside my memories of Arthur Rackham’s illustrations of Wind in the Willows. I love illustration—rather, I love it if it’s lovable. See below. And see this, for more of Kermit. Everyone says it: the art world has no memory. Of course it isn’t true that everybody says this. Nor is it true that the art world suffers from an across-the-board case of amnesia. Not only museums but also many galleries show work by artists from earlier times. The art magazines fairly often cast retrospective glances into this or that corner of the past. Nonetheless, there is a widespread feeling that denizens of the art world—especially younger ones—tend to focus exclusively on the present. So it is often said that history is being forgotten, if not by everyone then by just about everyone. It is said the past is the region not of origins acknowledged but of oblivion imposed. It is said that if we refuse to see where a work of art comes from we are not really seeing it. To forget history is to afflict oneself with a kind of blindness. And this affliction takes a particularly dire form in those younger artists who seem not to know the precedents for their own work. Guided by a few reflexes they picked up in school, they have reduced art-making to an unconsciousness routine. It’s as if they were sleepwalking in their studios. You know the phrase it’s too good to be true? The picture sketched by conventional wisdom is too bad to be true. In further posts, I’ll present a more accurate idea of the various ways in which a knowledge of history does, after all, inflect contemporary sensibilities. Before I do I want to say something about the allure of the present. Everyone feels it at one time or another, and I think it would be a good idea to ask why. Just what is it that makes the immediate moment so glamorous, so enchanting? More soon. Last summer, Phong Bui offered me the chance to serve as the guest art editor for the September issue of The Brooklyn Rail. The role brings with it a task: to pose a question. I asked: what is art? The question arose in Plato’s time, if not before, and ever since then writers have been addressing it, often vehemently but never conclusively. From a strictly logical point of view, a question with no clear answer comes under the suspicion of being meaningless. But a strictly logical point of view never shows us much about art and no one who responded to my question tried to sound like a logician. The respondents included artists and art historians, an architect, art critics and poets, editors and a gallerist. Their comments are sometimes puzzling, always brilliant, and ultimately irreconcilable. Art continues to resist definition—or it might be better to say that whatever is passionately intended and impossible to confine within a general definition has a good chance of counting as art. In any case, the full range of responses can be found at brooklynrail.org. Driving in the country, you sometimes see a large crowd of plaster statues in the gravel yard that fronts a cinder block shed. There is usually a Venus de Milo and a Discus Thrower, sometimes a Farnese Hercules. Jammed inside a cyclone fence, these dreadfully white objects look like the ghosts of Western Civilization, rounded up and waiting for nothing in particular. Nature answers Civilization in the form of a dolphin balancing on its tail and there might be a unicorn to represent fantasy, if not the supernatural. These statues always look forlorn, as if the indifferent sunlight had long ago leached away their meaning. They have the presence of husks, flimsy and dusty and preserving their familiar shapes out of habit, not conviction. But what a difference the “art context” makes. Last month, Jeff Koons showed a batch of these plaster statues at the David Zwirner Gallery, in Chelsea. Because this was a Koons exhibition, there was a snow man—just as there might be in a sculpture yard along Route 9W in upstate New York. There was a row of mailboxes and a bird bath, but most of the objects on view were casts of classical statues: the Barberini Faun, a crouching Venus, Apollo with his lyre, and so on. Far from flimsy and dusty, they looked crisp and solid. They looked confident and ready to be claimed as the trophies they are. Yet they were as empty as their counterparts on 9W, their meaning sacrificed to their service as pedestals for “gazing balls”—spheres of of dark blue mirror glass. Modeled on garden ornaments, the “gazing balls” recall the basketballs Koons suspended in glass cubes. One of them balances on top of Apollo’s lyre. Another rests on the shoulder of Diana, goddess of the hunt. Gazing into one of these balls, you see yourself and your environment curving around to center on you. Each globe reduces everything—the entire world, potentially—to a backdrop highlighted by your solitary presence. You are the subject and so there is no need to recall the significance of Apollo or wonder what it means that Venus, a goddess, is crouching as if in fear. Or your image is the subject and you already know all you need to know about that. 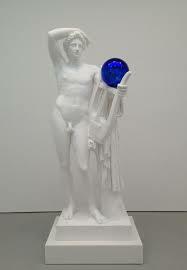 With the gazing balls, Koons has found a device that automatically flatters our laziness and the residue of infantile self-absorption that persists in us all. Imagine a revised edition of Shakespeare, who, according to Harold Bloom, is responsible for “the invention of the human.” It’s a big, thick book with an elegant cover made of some flawless, high-tech material. You open it and find that there are no pages, just an empty box of space. On the back wall of the box is a small mirror. You look into it, see yourself, and now you know all you need to know about Shakespeare. Because you are, after all, human and what else is there for you know? If she were writing now her figure of the artist would not, of course, be male–or not solely male. But she might very well define art now the way she did then. This idea of art emerged in the late 18th century and has persisted into the present. It is, after all, a serviceable idea. An individual acutely aware of his or her individuality reacts strongly to life, to the things and events of the world, and transforms these reactions into works of art. So far, so good, but this definition of art as self-expression is awfully vague around the edges. How does it distinguish art from, say, stand-up comedy of the kind that works off the comedian’s experience? How does it distinguish art from autobiography? You could say that some autobiographies are works of art. You might even want to claim the status of art for certain comedians’ monologues. But what about a spontaneous outburst in response to a crisis? Let’s say that it is sincere, it is detailed, and thus richly self-expressive. Is it art? This is a very smooth move, one that poets have been making for a long time. See Wordsworth and Coleridge’s “Preface to Lyrical Ballads.” I call it a smooth move because there is something attractive about the idea that our strongest emotions make us not only expressive but, in addition, so eloquent, so formally elegant, that we become poets. And there is a degree of truth to this idea. Sometimes extreme feelings generate amazing turns of phrase. Mostly, though, this doesn’t happen. There is no reliable progression from feeling to form, and so any definition of art that depends on this progression is dubious. Am I saying that emotion plays no part in the writing of a poem or the painting of a painting? No, but I am saying that speculations about poets’ and painters’ emotions lack all explanatory force, especially when we focus on any but the broadest, most general matters of form. Felt emotions are subtle, no matter how powerful, but talk of emotions is ham-handed when it turns to form of any complexity. So where does this leave me, as I approach, tentatively, a definition of art? Not much advanced, of course, and yet I think it is of some value to note–as many have noted before me–that talk of emotions, whether those of the artist or those of the audience, doesn’t get us very far. For talk along these lines never accounts for the differences between emotions that lead to art and emotions that do not–in other words, it doesn’t help us understand the appearance of artistic form. Nor does talk of art and emotion distinguish our emotional responses to art from our emotional responses to non-art. Still, I should acknowledge again that I believe that the artist’s feelings are in some way generative. And I suspect that much of the artist’s most productive emotion–not all of it but much of it–is felt in the course of playing around with form . . .